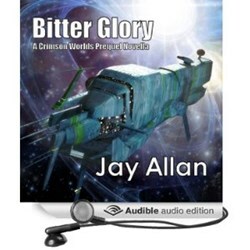 With several new audiobooks out in 2013, Scifi Publishing lists its top selling audiobooks of the year. "With the demanding lives that many people now lead, the adoption of digital media, we are witnessing the perfect storm brewing for the audiobook media industry"
Audiobooks overall have seen an increase in sales in 2013 as a result of the observations made by Audiobook reviewer Chuck Field from Geeknutz below. Having a family and a day job makes running a website on the side somewhat challenging. One of my favorite passions; reading, has all but disappeared. I used to burn through a complete novel in a couple of weeks and now I’m lucky to get one done in a couple of months. Fortunately, digital media and portable electronics have made written content more accessible through audible means. In audible formats unabridged books can be consumed while performing other tasks almost as quickly as the traditional page turning method. I find that I can burn through a book while driving or completing one of the many items on that ‘honey do’ list. Sci-Fi Publishing enables authors to bring their work to life, creating powerful audiobooks for Science Fiction and Fantasy fans. We partner with authors from audiobook production to marketing so they can continue to focus on their passion, creating new and amazing worlds.